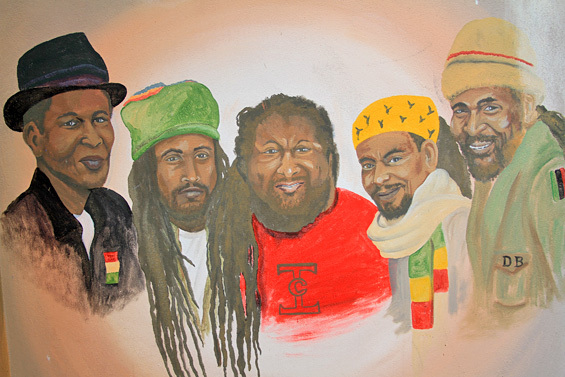 Inner Circle helped invent reggae. Now, 45 years after they started, the group is still on tour — not even a bus crash in Baton Rouge can stop them. They perform at Los Globos on Sunday; Jacob Katel of The Los Angeles Times caught up with them at their recording studios in Miami the day they left. In high school they picked up guitars and found their way to Byron Lee’s Dynamic Sounds Studios. At the national Jamaica Song Festival that year, they backed Eric Donaldson on “Cherry Oh Baby.” Donaldson won the competition, and immediately joined Inner Circle at Dynamic Sound to record his hit. Then they toured the Caribbean and Belize with it. The song has been covered over 50 times, including by the Rolling Stones. In 1971 they played over 150 shows on the “bandwagon tour” with Bob Marley and The Wailers and others, including Clancy Eccles, who is said to have derived the term reggae from the word “streggae” (roughly, ‘easy girl’). Meanwhile, more and more fans started turning out to Inner Circle’s concerts. After the tour, Marley and Peter Tosh drove an Oldsmobile to Inner Circle’s house on Chelsea Ave and asked them to back Bob and The Wailers on “Stir It Up” for their new album Catch A Fire. Inner Circle also worked with studio kingpin Coxsone Dodd at Studio One, with dub pioneers King Tubby and Bunny “Striker” Lee at the Fire House, with engineering pioneer Lee “Scratch” Perry at Black Ark. In 1974, fiery rasta youth Jacob Miller talked his way into the band after receiving an introduction. He energized crowds with his improvisations, and vocal tricks. He added an echo effect to his singing, and was dubbed “man with the bionic voice.” He helped the band become the most in-demand act on the island. From 1974-80 they recorded albums for Top Ranking, Trojan, Capitol, and Island Records, coming up with original songs plus American R&B, funk, rock, and disco covers. They also recruited longtime cohort Bernard “Touter” Harvey full time. He’d been playing piano, keys and organ for Bob Marley, and Burning Spear among others. 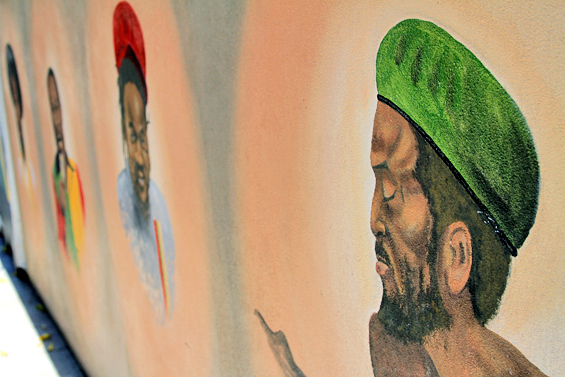 In 1978, at a show dubbed the “Peace Concert” in Jamaica’s National Stadium, Jacob Miller spontaneously invited the baddest thugs of the rival gangs of West Kingston’s Trench Town and Tivoli Gardens, Claude Massop and Bucky Marshall, onto the stage and brought them together for a truce. After Inner Circle’s set, which was caught on film for the movie Heartland Reggae, Peter Tosh performed, and then Bob Marley. Inspired by Miller’s bravado and in a friendly act of competitive one-upmanship, Marley invited the leaders of the rival political parties, Edward Seaga and Michael Manley, onto the stage. He got them to lock and raise their hands at the height of his set during the song “Jammin’.” This moment is often referred to as one of the more historic in Marley’s career. After Jacob Miller’s death, Ian Lewis and keys player Touter Harvey moved to Miami and opened Circle House’s recording studios, where Uncle Luke cut early 2 Live Crew hits, and filmed music videos by the pool. As you can see, Inner Circle’s roots run deep.